Ahmad Fatemi, member of Unionen in Sweden and director of Mission Free Iran, has nominated the Iranian Free Workers’ Union for the Arthur Svensson International Prize for Union Rights. The Svensson Prize is presented to a person or organization who has promoted union rights and/or strengthened unionization. The prize was established by Industri Energi, a Norwegian federation of trade unions that organizes employees in the field of oil and gas, chemical industries and woodworking industries, in honor of Arthur Svensson (1930-2008) who was one of Norwegian Trade Union Movement’s most prominent representatives and whose legacy in Norwegian society has had profound effect by creating better conditions for Norwegian workers. 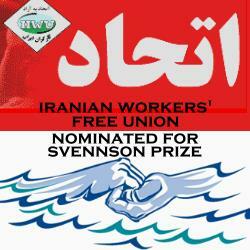 We thank you for this opportunity to submit the name of the Iranian Workers’ Free Union (IWFU) for the 2012 Arthur Svensson International Award for Union Rights. We believe IWFU’s ongoing struggle for union rights in Iran marks it as an organization worthy of this award given in honor of Mr. Svensson’s legacy. The IWFU was founded in November 2006 under a regime that criminalizes the formation of free and independent unions. Prior to 18 April 2008, IWFU was called the National Union of Expelled and Unemployed Workers. The Iranian Workers’ Free Union is an independent organization that organizes and represents the interests of its members: contract, permanent, expelled, unemployed and unpaid workers. The members of the Iranian Workers’ Free Union are related to all divisions of production and services in Iran. Since its establishment, IWFU has tried to do exactly what a workers’ union is supposed to do (1), and if there is a difference, it is due to the price that IWFU members and especially its elected leaders have paid and continue to pay under the brutal dictatorship in Iran. Most recently, several executive board members of IWFU have been arbitrarily detained, one after the other in rapid succession, for demanding that the authorities provide services to people who, due to grinding poverty, have resorted to living on the street. On this occasion, as on many others, IWFU has successfully represented its members’ political and social rights by organizing protest actions and mobilizing the society. As a result, two of these very well known and respected labour activists, Mozaffar Saleh Nia and Sharif Saed Panah, have been released. However, Shith Amani, another executive board member of IWFU, remains in jail. Notably, no charges have been brought against any of the three (2). The Iranian Workers’ Free Union was a key participant in the declaration of what is certainly one of the world’s most progressive set of demands as Iranian workers’ minimum demands. There, IWFU manifests its indisputably humane position in support of complete gender equality and unrestricted recognition of all childrens’ rights, and against poverty and racism, among other demands (3). IWFU also gives Iranian workers their own voice by disseminating and publishing the Iranian working class struggle for their rights. The union serves as an essential conduit of information to the outside world, informing activists worldwide about workers’ conditions and lack of workers’ rights in Iran. It has done this despite numerous efforts to shut down their website (http://www.etehadeh.com) by the Islamic Republic regime, which needs to silence the voices of the Iranian working class, particularly during these times of economic crisis and sanctions. IWFU also introduces to the Iranian working class news of our comrades’ struggle for social and economic justice across the globe. In sum, because of their ongoing struggle to promote the rights of workers, unions, the working class, and the unemployed, we nominate IWFU for the Arthur Svensson International Award for Union Rights. This nomination is being made by myself, Ahmad Fatemi, an active member of Unionen in Sweden, on behalf of Mission Free Iran, an organization that supports the struggle for freedom and equality in Iran and worldwide. There is no direct relationship between myself and the IWFU; however, my organization Mission Free Iran has supported individual members of IWFU to establish refugee status after they were forced to flee life-threatening political persecution in Iran based on their demands for workers’ rights. We thank you for your considered attention to this nomination. “The union recognizes itself as a vessel for all Iranian workers to reach their goal: a humane life in accordance with modern standards and the progression towards a humane society for the working class.” — Article 4, Objectives of the Iranian Workers’ Free Union. (2) 24 January 2012. Report from Free Them Now! Campaign to Free Jailed Workers in Iran: Two trade unionists released, but more arrested. Two worker activists by the names Sharif Saed Panah and Mozaffar Saleh Nia, both members of the Free Union of Iranian Workers, who were arrested earlier this month, have been released on bail. The release follows several weeks of campaigning both inside and outside Iran. The released workers were jubilantly greeted by their family and supporters outside the offices of the Ministry of Intelligence in Sanandaj. However, a number of other trade unionists have been detained, or summoned to the Intelligence Ministry: In Tabriz, Shahrokh Zamani and Mohammad Jarahi were detained while out on bail, while Nima Poor-Yaghoub and Sasan Vahebi-Vash were summoned. Zamani and Jarahi are both members of the Follow-up Committee to Set up Free Labour Organisations. Last August, a court sentenced all four to long prison terms: Zamani to 11 years, Jarahi to five years and six months, Poor-Yaghoub to six years and Vahebi-Vash to six months. Almost simultaneously in Sanandaj, Sheis Amani, well-known leader of the city’s textile workers and a board member of the Free Union of Iranian Workers, was detained when enquiring about the cases of other jailed workers at the Prosecutor’s Office. Meanwhile, other trade unionists, such as Reza Shahabi and Ebrahim Madadi, leaders of Tehran’s bus workers’ union, Behnam Ebrahimzadeh, member of the Follow-up Committee to Set up Free Labour Organisations, Ali Nejati, leader of the sugar cane workers’ union and Rasoul Bodaghi, from the Teachers’ Trade Association, continue to serve long prison terms for their union activity. We call on all trade unions and human rights organisations to condemn the latest arrests and the continued jailing of trade unionists, and to demand the immediate and unconditional release of all those detained. « 22 Bahman / 12 February Protest Against 33 Years of Islamic Republic Crimes against Humanity: Not One More Execution! Free Political Prisoners Now! I am very happy to know this great news. This is the beginning for different European governments to understand the hard work Mr. Ahmad Fatemi does in Iranian Workers free Union and in Mission Free Iran.